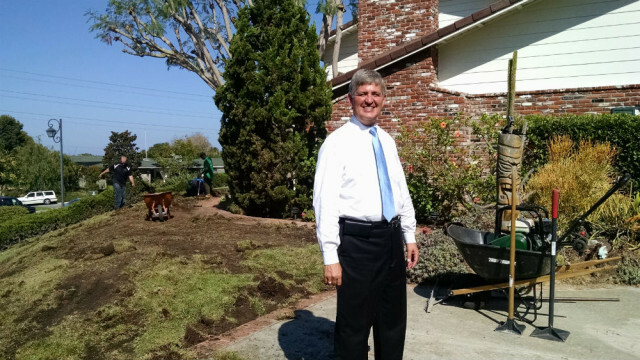 To set an example amid the statewide drought — and save his family money — county Supervisor Dave Roberts is replacing his lawn with artificial turf. Roberts met with media outside his home in Solana Beach on Monday as workmen began tearing up his 6,000-square-foot lawn. 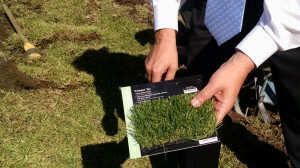 Roberts compares an artificial turn sample to his lawn. “We’re in drought level 2, so it’s really important that people look at alternatives,” said Roberts, who represents the county on the board of the San Diego County Water Authority. He said he chose turf instead of gravel because it blended well with his brick, colonial-style home. He estimated the project would cost $30,000 after rebates, but would pay for itself within nine years with water savings. The project is eligible for rebates and Roberts can finance it through an assessment on this property tax bill under the Property Assessed Clean Energy, or PACE, program. Interest on the financing is tax-deducible, like mortgage interest. PACE is administered in California through the Home Energy Renovation Opportunity or HERO, organization. Roberts said the project is “smart financially and smart environmentally” and should be finished by the weekend. “I can’t wait to see the final product on Friday or Saturday,” he said.